Hello India. Uber is going lite. The ride-hailing giant unveiled Uber Lite in India on Tuesday, claiming in a blog post the app would use 5MB of data, as compared to the regular Uber app’s 181.4MB size. Gone is the map with tiny Uber vehicles that users typically see when opening the app, replaced with a very stripped-down design. It’s only compatible with Android phones, which the majority of the app’s target audience uses. According to Uber, the new app should help riders with “spotty connectivity” or “limited data plans” by using a progress bar instead of a map to show how close the driver is. It will also show popular pickup points when it can’t detect a rider’s location. Uber said it wants to capture the “next hundreds of millions of riders” in India who will be coming online through low-cost smartphones and cheap data plans. 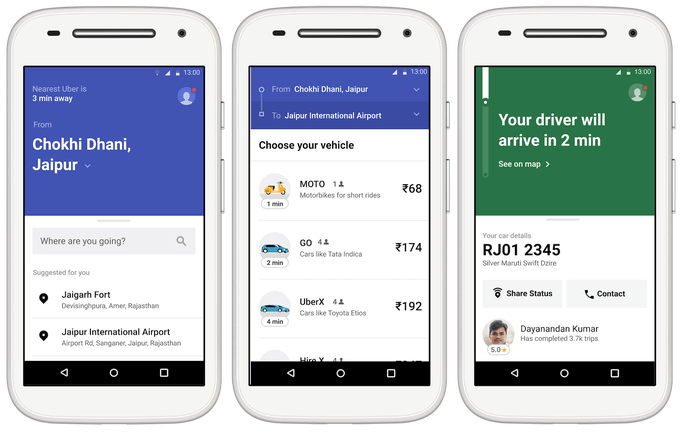 The app will soon add multiple language choices — a key feature in India with its dozens of regional languages — and the ability to book rides offline. India’s Ola rideshare service already has a ‘Lite” app that’s just 1 megabyte and a 45% share of the taxi market, compared to Uber’s 35%. Uber has reported has talked with Ola about a possible merger in India, sources have told TechCrunch and others. Success with Uber Lite could give it leverage with Ola and path to gaining more of it around the world. Uber Lite will be expanded to more countries later this year, the company said.